Afghan Energy Minister Ismail Khan has survived a roadside bomb attack in the western city of Herat, police say. At least four people died and several others were wounded when the bomb exploded as the minister was driving to the airport, officials say. A Taliban spokesman claimed responsibility for the blast in a telephone call to news agencies. On Friday, Afghanistan's rising violence prompted the top US commander to formally request more troops. Gen Stanley McChrystal has said in the past that the mission in Afghanistan is likely to fail if he is not given extra forces. 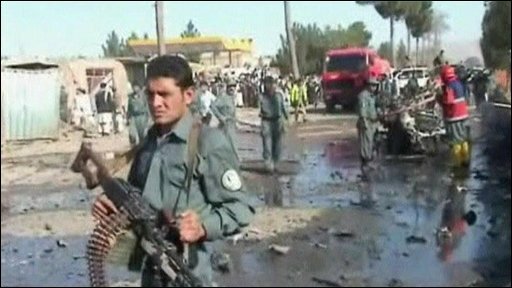 The explosion in Herat happened outside a school, officials said. Police spokesman Raouf Ahmadi said that 17 people had been wounded, including four of Ismail Khan's bodyguards. He said the minister had arrived safely at the airport. The four dead included a woman and a child, Mr Ahmadi added. Ismail Khan was a key member of the Northern Alliance, whose forces helped US troops to topple the Taliban in 2001.